Edmund Schweppe | Just another WordPress site. For the moment. Where is the foreman on our software projects? To pass the test, the system had to hold test pressure for a specific period of time. So, the very first time I was involved in one of these hydrostatic tests, we had all the valves lined up properly, the system was filled with water, and one of the shipyard workers started the pump … and the pressure didn’t go up. They ran the pump some more, and the pressure still didn’t go up. It turns out that one of the welded pipe joints hadn’t actually been welded fully. The presence of those above-mentioned shipyard foremen didn’t prevent one particular welder messing up. Neither did any of those foremen spot the problem prior to hydrostatic testing. Eventually, the leak was found, and fixed, and successfully tested. Eventually, in fact, we got all the systems working again. Eventually, we were able to take our newly-overhauled submarine out to sea and start performing the sorts of missions we were being paid to accomplish. And all that happened despite having all those foremen. So would having foremen in software development solve our problems, as Uncle Bob implies? If you want to get a project done, done right, and done on time, you need a foreman. And that foreman has to be so technically astute that he can check the work of all the workers. He has to have the authority to reject any work he considers sub-standard. And he also has to have the power to say “No” to the unreasonable demands of the customers and managers. It’d probably be very helpful; don’t get me wrong. In fact, I’d love knowing that a second set of eyes would look at my work, providing a backstop in case I missed something, or giving me glowing feedback about the stuff I got right. I’d love having people on my team with both the skills and the bandwidth to do that sort of review quickly enough that the review process didn’t bottleneck the project as a whole. I’d love knowing that the organization I’m working for values high-quality work enough to assign that sort of person to my projects, not to grind out code, but to keep the standards high. But having foremen is not sufficient to guarantee project success. I found that out back in the yards, many moons ago. In astronomy there is the concept of red-shifting and blue-shifting: red shifting occurs when a body is moving away from you (the wavelength of the light increases) and blue-shifting occurs when a body is moving towards you (the wavelength of the light decreases). This is useful input for determining the speed and direction of something. In software development we have green shifting which occurs when people rework the information contained in status reports to make them more politically palatable to their manager. A few years ago I was involved with a seriously challenged project. In my weekly status report to the project manager I would very bluntly list all of the problems we were experiencing. Strangely, even though myself and several others were clearly documenting the problems, all of which were out of our control, nothing ever seemed to happen. After a few weeks of this I ran into the CIO and she congratulated me on how well the project was going. I was surprised, and told her that the project was in serious trouble and summarized the critical issues for her. It was news to her. After a bit of investigation we discovered that although myself and team members had been reporting the serious political challenges that the project team faced, when our project manager summarized our reports he decided to put a better spin on it and reported that the team found the project challenging. His manager in turn reworked it in his report that the team enjoyed the challenges it faced. This was the report which the CIO received. The problem is that the project status “green shifted” as it rose through the various levels of management. The people on the ground were very clearly reporting a red project status, our project manager wanted to play it safe so reported yellow status, and his manager was more political yet and reported green status. 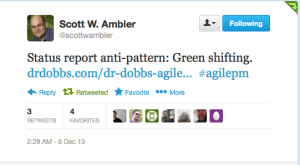 This “green shift” isn’t just a problem in the software world. Any time somebody has to report upward to a more powerful person in the organization, there’s going to be some tendency to try and make any bad news less unpalatable. Filtered through multiple reporting levels, it’s all too easy for the bad news to be completely lost by the time the top person gets the report. There are, fortunately, a number of ways for leaders to overcome this problem. Scott describes one simple one: the agile practice of a short daily standup meeting, where each team member provides a quick verbal status report. Anyone else interested in the project status is welcome to attend the meeting as an observer. and the Executive Officer reports to the Captain. The above techniques are clearly not specific to software development. One technique that is very software-specific is the agile practice of running short iterations, each of which delivers working code. Frequent releases are pretty binary; either you release working software every X days or you don’t. Suppose the person who’s signing the checks on a one-year project insists on seeing working software every two weeks. If the project hasn’t delivered anything new for six weeks, the person signing the checks knows something’s wrong, regardless of any green-shifting that might be occurring in the status reports. Alas, all of these techniques depend on the leader devoting time and energy to supplementing status reports with hard data. If that leader chooses to restrict himself to status reports, he runs the serious risk of green-shifting hiding bad news for months or even years. The consequences can be calamitous; just ask anybody who’s been involved in a multi-year project that gets cancelled after burning through millions of dollars and thousands of hours of people’s lives. I suppose, if one gets much ego-boo from showing off one’s debugging chops, a test-first or test-driven style might be a problem – because you don’t have much debugging to do.